The Scrappy Genealogist: Got Your mtDNA Haplogroup? An exciting email landed in my box early this morning. Build 15 of Phylotree was released yesterday and my husband's mtDNA, or maternal dna, has been officially documented into a new subgroup, W1h. Mark Wade of the Haplogroup W website sent me this breaking news. What does this mean? Immediately I forwarded the email to said husband, who responded "What does this mean?" What it means is that we are in an explosive period of genealogical DNA research. With the advent of new companies offering genealogical testing, more and more every day folk are swabbing their cheeks, spitting in cups and sending off their samples to be analyzed. As new samples are read and analyzed they can then classified according to where they fit in the phylogenetic tree of global human mitochondrial DNA, but many samples will not fit into a current mtDNA haplogroup or subgroup. What does it mean for my husband? When my husband's mtDNA results were read by FamilyTreeDNA, his mtDNA seemed most likely to fit into the W1 haplogroup, but had a couple of differences or mutations. Because his mtDNA was unique, he did not have any cousin matches through FamilyTreeDNA. While researching to better understand the results, I found Mark Wade's website and he was indispensable to my understanding of mtDNA. He explained that my husband's mtDNA would receive a new subgroup designation if at least two results were submitted to Genbank, which is the central repository of whole-sequence mtdna results. A new subgroup is born! There is another human being, a cousin many times removed, somewhere in the world who must have submitted his or her mtDNA results because Phylotree has added a new subgroup, W1h, to the W1 haplogroup. What this means, dear husband, is that somewhere in the world, there is a human being, who shares an ancient maternal ancestor with you. * Update 5 October 2012: Please head over to Mark Wade's page to read his update about W1h. He added a graphic to better explain this subgroup. My husband's cousin and he are on two different branches, which descend from a common ancestor, roughly 6500 to 8000 years ago. 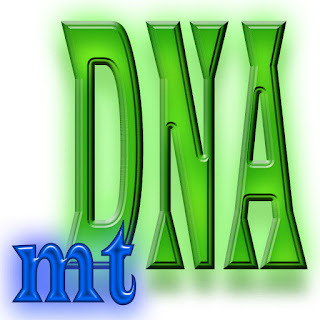 Do you know your mtDNA haplogroup? Mark Wade, Unknown Location[(E-ADDRESS FOR PRIVATE USE),] to Jennifer Shoer, e-mail, 16 April 2011, "W1 haplogroup," Inbox Folder, DNA; privately held by Jennifer Shoer, [(E-ADRESS) & STREET ADDRESS FOR PRIVATE USE,] Portsmouth, NH. Mark Wade, Unknown Location [(E-ADDRESS FOR PRIVATE USE),] to Jennifer Shoer, e-mail, 3 October 2012, "W1 haplogroup," Inbox Folder, DNA; privately held by Jennifer Shoer, [(E-ADRESS) & STREET ADDRESS FOR PRIVATE USE,] Portsmouth, NH.